For pizza dough - In a large bowl, combine water, yeast and honey. Mix with a spoon, then let sit until foamy, about 10 minutes. Add in the flour and olive oil stirring with a spoon until the dough comes together but is still sticky. Using your hands, on a floured surface, form the dough into a ball and work the additional 1/2 cup flour into the dough if needed. All of the mixing and kneading can also be done in a stand mixer with the dough hook attachment. Next, rub the same bowl with olive oil, then place the dough inside, turning to coat. Cover with a towel and place in a warm place to rise for about 1 1/2 hours. In a blender or food processor, add the cilantro, green onions, lemon juice and 2 tablespoons olive oil. Pulse until chunky, finely chopped and pesto-like. Remove from the blender and place in a bowl. Store the cilantro sauce in the fridge until ready to serve. In the same blender or food processor, make the romesco (no need to clean it!). Add the chipotle chiles, sun-dried tomatoes, toasted almonds, garlic and salt. Begin blending and then slowly pour in 1/3 cup olive oil (or use the reserved olive oil from the sun-dried tomato jar). Blend until the sauce is combined and smooth, but not totally pureed. Once the pizza dough is ready, lightly flour a counter. Divide the dough into 2 balls (or make one large sheet pizza). Use your hands or a rolling pin to roll the dough out until you have a flattened disk. Place the pizzas on a greased baking sheet and then use your hands to gently tug, pull and push the pizza dough into your desired shape. If needed, trim the parchment paper down so just about an inch overhangs from the sides. Spread the romesco over each piece of dough. Top with equal amounts of mozzarella and fontina cheese. Now crack the eggs over the cheese, sprinkle with salt and pepper...and maybe a little more cheese. Bake 25-30 minutes or until the cheese is melted and the egg cooked to your liking. Meanwhile, make the salad. Working with 1 asparagus spear at a time, use a vegetable peeler to shave spears into long, thin shavings. Transfer to a medium bowl. Combine grated Parmesan and lemon juice in a small bowl and slowly whisk in oil until well blended. Season vinaigrette generously with salt and pepper. Drizzle vinaigrette over shaved asparagus and toss to coat. 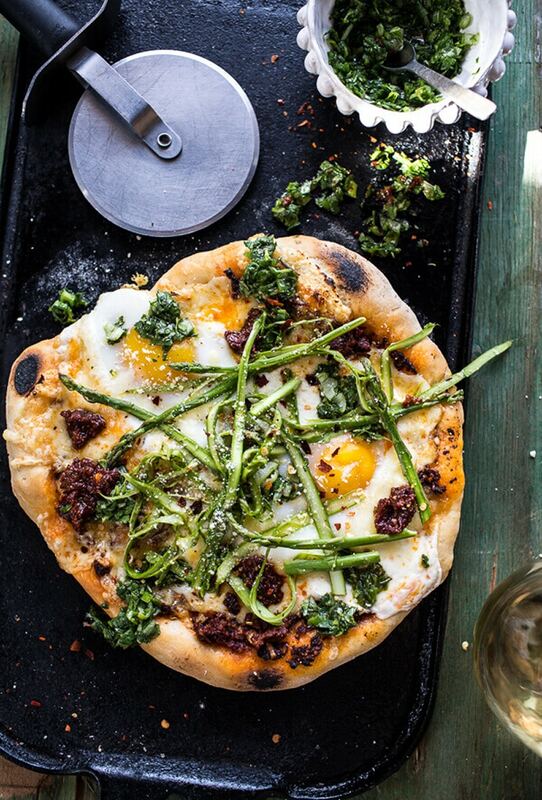 Remove each pizza and top with the cilantro sauce and the shaved asparagus salad. Sprinkle with parmesan and crushed red pepper flakes if desired.